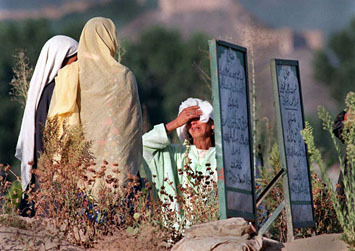 ( Above: Anguished by the death of her son, a Moslem woman weeps at the Martyrs' cemetery in Srinagar. 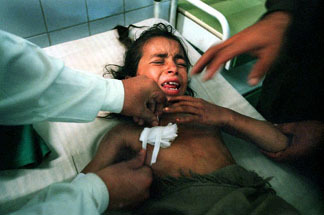 her son a mujahideen fighter was killed by Indian security forces for having ties to the separatist guerrilla movement. Above r: A four year old girl lies on the floor at a refugee camp in Delhi India. Her family has become part of the exodus of Hindu families fleeing the largely Moslem militancy.